Our goal is to help you select the perfect tutor that suits your needs. Whether you are trying to learn or improve your skills on a particular subject, we are here to help you reach your goal. In this startup, we are looking for partnership in creating a p2p website on education. The ideal website would have a similar UI as Airbnb (older version). 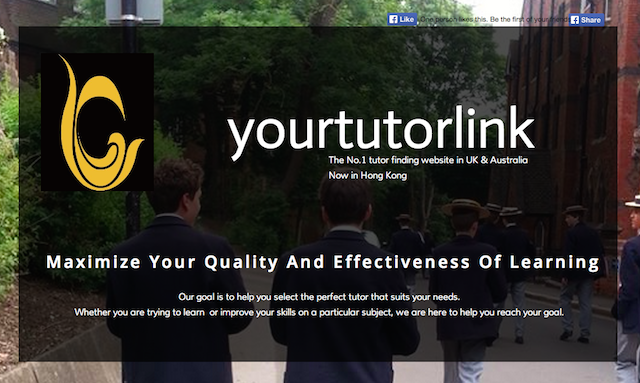 Every Student in Hong Kong or China would attend tutorial classes or lessons with tutors outside school time. The aim of the website is to link tutors and students together. To provide a platform for students to seek help in education or adults learning new abilities by matching teachers. A p2p platform which allows different client to search for teachers. After each lesson or a period of lessons, students write a review and acknowledge the ability of the teacher. From this review system, students are more ensured to get a good teacher in future. Each teacher and student should have a clear page introducing him/herself. Listing of hobbies, stating which subjects need help. Allow immediate enquiry and communication between teachers and students for follow up after each booking is made to ensure students are clear what to bring and where to go. To show the availability of teachers and students and what time they will be teaching. level system (similar to Weibo): using exp to show encourage them to use the platform, the higher level you are, the more chance of you being exposed to students which increase a chance of bookings.